An end of an era has hit Oakland. That would be the actual end of the last World War II-era military hospital in California, the Oak Knoll U.S. Naval Medical Center. It has been targeted for implosion. This is the last building standing from the original 167 acre medical complex in Oakland. In its heyday, this center was home to military barracks, stores and administration buildings along with the hospital. It’s going to take 800 pounds of dynamite to bring down this building and then the real clean-up can begin. Imagine for a moment, if you were put in charge of that cleanup. First of all, this building was officially decommissioned 15 years ago. That meant it was probably stripped to its bare bones. All the hospital files, furniture and equipment would have been long gone. Anything else of value like lighting fixtures, sconces, copper pipes or scrap metal would have also been pulled out. Basically, what you would be left with would be tons of concrete, wood, rebar and glass. Not exactly the most “friendly” pile of garbage. It’s also probably going to take months to haul away all that garbage dump truck by dump truck. What would happen if you had to decommission your Oakland home? Perhaps that’s a drastic question to ask, but you’ve probably got some big items in your house that you could do without; specifically some old furniture. The number one reason why people hang on to their old furniture is that they don’t have any viable way of getting rid of it. That has changed thanks to the emergence of your local Oakland based furniture pickup crew – Junk King. These are experienced haulers who have the muscle and the trucks to take away any large furniture item in your home that has seen better days. 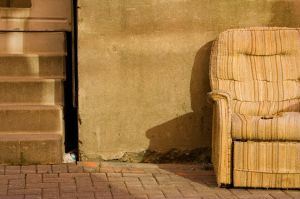 You don’t have to wait any longer to get rid of something that is an eyesore. Having a professional team of haulers take away your furniture is a much better choice than dragging that sofa or easy chair out to the curb and hope it will magically disappear. The big problem with that option is that the furniture ends up getting wet, moldy and disgusting forcing the city to take out time from providing other services to pickup that sofa. Before that it’s just a plain hazard. Also consider that you could actually be fined for illegally dumping that furniture on the street. Yes, there are laws on the books in Oakland that target folks who want to make streets their own dumping ground. The other benefit with hiring a professional company like Junk King to handle your furniture pickup is that you’ll know who you’re inviting into your home. You really don’t want to take a risk with day laborers. To schedule an Oakland Furniture Pickup appointment today simply call 1-888-888-JUNK or book a free on site estimate online. This entry was posted in East Bay Junk Removal, Oakland Furniture Pickup, oakland junk removal and tagged Demolition Cleanup, Get Rid of Old Furniture, Oakland Furniture Disposal, Oakland Furniture Hauling, Oakland Furniture Pickup, Oakland hauling, oakland junk removal, US Naval Medical Center on April 11, 2011 by Junk King. Last updated August 4, 2017 .